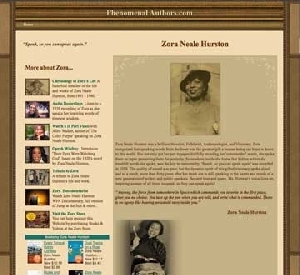 While a new generation is listening to the dynamic voice of Zora Neale Hurston, there is also a new generation of writers following in her footsteps. It is our personal mission to see they that they follow in her greatness, and not in her despair. Talent and genius combined with dedication and hard work should not go unnoticed or unrewarded. It is up to us, as women, as writers and as human beings to help build a 'LIVING' system of support to contemporary writers and future inspirational geniuses who are willing to speak, so they can speak again.